Enjoy an afternoon at the spa pool and tanning island at our award-winning southwest resort. 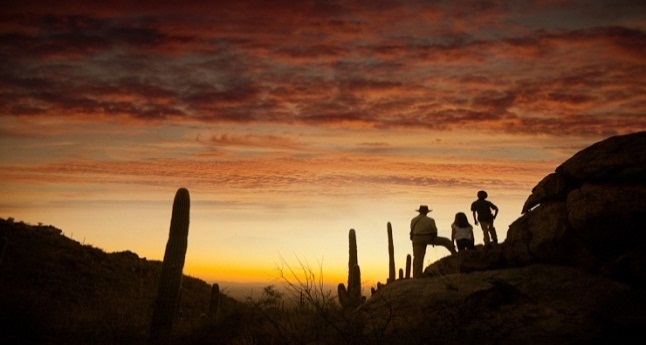 Discover a magnificent sunset at our resort near Phoenix. 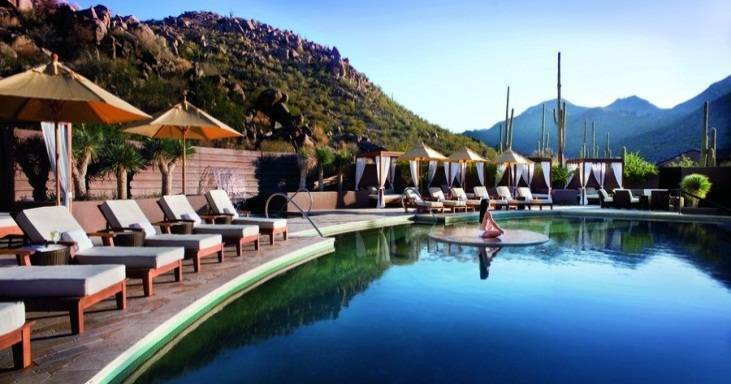 TUCSON, AZ--(Marketwired - Sep 30, 2015) - The Ritz-Carlton, Dove Mountain is celebrating the receipt of a prestigious new rating for 2016, as AAA has presented the southwest resort with its first ever Five Diamond award. The accolade comes just months after Forbes presented a coveted Five Star rating to the property, making The Ritz-Carlton, Dove Mountain one of the few hotels in North America to carry Five Diamonds as well as Five Stars. "This AAA Five Diamond award is a well-deserved acknowledgement of the 350 Ladies and Gentlemen who create the guest experience here at The Ritz-Carlton, Dove Mountain," said Liam Doyle, General Manager. "Because of their deep personal commitment to exceeding guest service standards and to bringing a truly stunning destination to life, ten Stars and Diamonds are now shining brightly over southern Arizona." Five Diamond establishments represent less than 0.003 percent of over 28,000 hotels which are AAA/CAA Approved and Diamond Rated. In making its influential award decisions, AAA's professionally trained inspectors use published guidelines to evaluate a property in-person, sometimes over the course of multiple visits. They then submit their findings for a final decision rendered by a panel of experts. With a greater inventory than any other rating entity, AAA's rating system covers the U.S., Canada, Mexico and the Caribbean. AAA has been inspecting hotels and restaurants for 79 years, and for 2015, only eight hotels were added to the Five Diamond roster. A total of only 121 hotels throughout the United States, Canada, Mexico and the Caribbean received the 2015 AAA/CAA Five Diamond Rating. With a focus on golf, spa, adventures and outstanding dining, The Ritz-Carlton, Dove Mountain creates #RCMemories in a lush high Sonoran Desert setting between Phoenix and Tucson. Located in the scenic foothills town of Marana, the 253-room resort presents an authentic southwestern sense of place where guests can escape, play -- and return to the youthful joys of life. Highlights include three swimming pools, a 235-foot water slide and splash pad, 27 holes of adjoining Jack Nicklaus signature golf, daily Sunset Vista Cocktail Hikes, guided rock art tours to discover ancient Hohokam petroglyphs, GPS-guided geocaching, morning Nature Walks, Cactus Discovery tours showcasing the rare and ancient Saguaro, astronomer-guided stargazing, and access to miles of scenic and beautiful hiking, cycling and four-wheel drive trails. A daily highlight is the Tucson resort's signature Spirit of Adventure Celebration, when guests gather to welcome the evening and take in the haunting refrain of a Native American flutist performing from the surrounding Tortolita Foothills. An adventure-filled Ritz Kids Rangers program provides younger guests with myriad delights, including indigenous critter meet-and-greets, desert expeditions and even In-Room Camping. An Arizona spa vacation is in store for couples and individual travelers as well, as The Ritz-Carlton Spa, Dove Mountain features spectacular open-air design, a private serenity pool with tanning island, spa cabanas, day beds and a roster of treatments inspired by the healing therapies of centuries-old Native American civilizations. For foodies, award-winning restaurants are complemented by weekend sushi in the lobby, the charming Roadrunner Food Truck which plies the resort grounds with holiday weekend ice cream treats and which also raises charitable funds via local food truck rallies, acclaimed wine and spirits experiences, and the hotel's own Dove Mountain Cuvée wine label. A 42-tree citrus orchard sits directly outside of the resort's award-winning CORE Kitchen & Wine Bar, encouraging guests to pick their own fresh Arizona citrus for memorable morning libations. Reservations for The Ritz-Carlton, Dove Mountain may be made at 800-241-3333, at www.ritzcarlton.com/DoveMountain, or through a travel professional, or guests may engage directly with the resort at https://facebook.com/ritzcarltondovemountain/. Dining and spa experiences, luxury weddings, shared voluntourism/VolunTeaming™ activities, and award-winning meetings, weddings and events may be requested at 520-572-3000. The destination is served by both the Tucson and Phoenix international airports. The Ritz-Carlton Hotel Company, L.L.C., of Chevy Chase, Md., currently operates 90 hotels in the Americas, Europe, Asia, the Middle East, Africa, and the Caribbean. More than 40 hotel and residential projects are under development around the globe. The Ritz-Carlton is the only service company to have twice earned the prestigious Malcolm Baldrige National Quality Award which recognizes outstanding customer service. For more information or reservations, visit the company web site at www.ritzcarlton.com, and for the latest company updates, visit news.ritzcarlton.com. The Ritz-Carlton Hotel Company, L.L.C. is a wholly-owned subsidiary of Marriott International, Inc. (NASDAQ: MAR).